Chicken thighs are my favorite part for roasting; once roasted, the meat is flavorful and juicy, while the skin turns crispy and tasty. Another favorite it to season it with garlic, lemon and/or light wine, which are so perfect with chicken. To this I’ve added this time lots of fresh herbs, chopped scallions and jalapenos, which added wonderful fresh flavors and color. 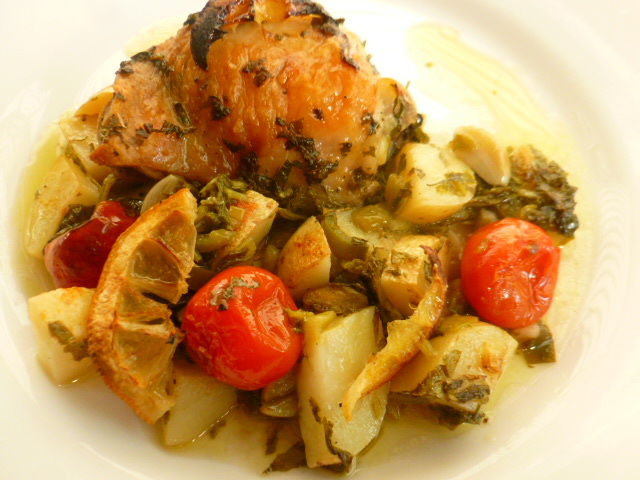 Adding cut potatoes to the pan, along with a few cherry tomatoes, created a full meal, which can be easily served. The result is a light, yet hearty dish, bursting with flavors and aroma. Try it and enjoy. 1. Place the chicken in a large bowl. 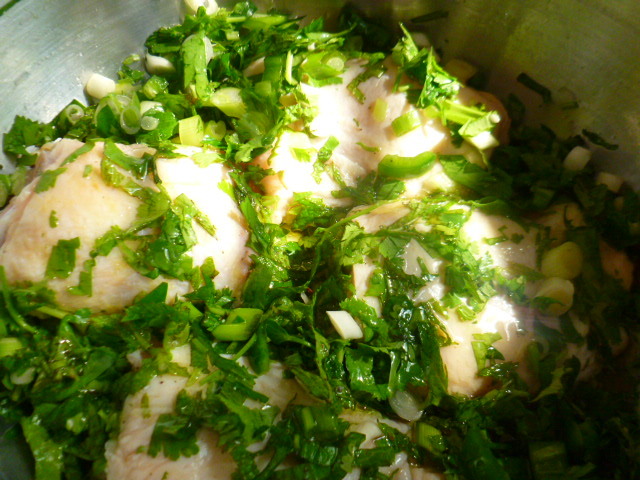 Add the wine, lemon juice, salt, pepper, scallions, herbs and jalapeno, and mix. Add the olive oil and mix again to coat. Cover the bowl and place in the fridge for 2 hours. 2. Add the potatoes and cherry tomatoes to the bowl, and mix well. Let sit at room temperature for 10 minutes. 3. Preheat the oven to 425F (220C). Line a roasting pan with baking paper. 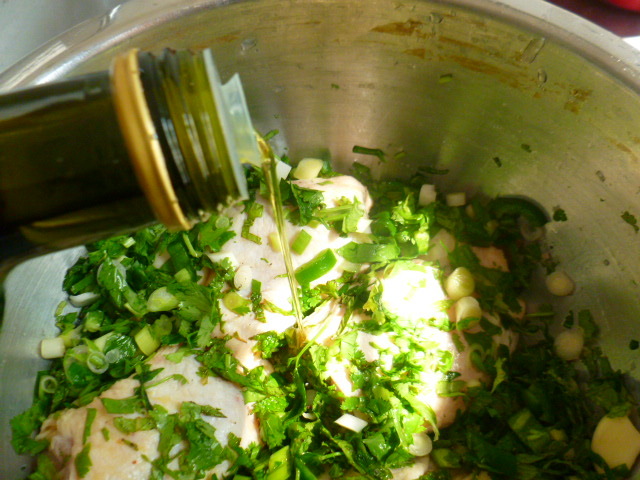 Arrange the chicken thighs and herbs in the pan, leaving the skin clean. 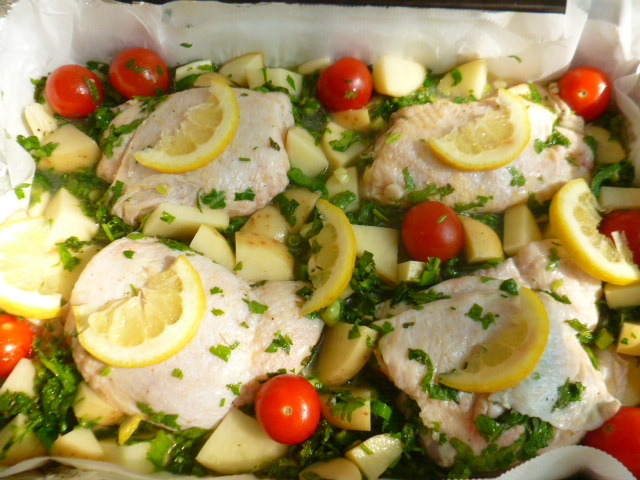 arrange the potatoes and cherry tomatoes around the chicken, and top with the sliced lemon. Roast for 1 hour, until the chicken and potatoes are golden-brown. Thank you John, I’m glad you liked the dish. I cook thighs often, so there are quite a few recipes for them here by now. 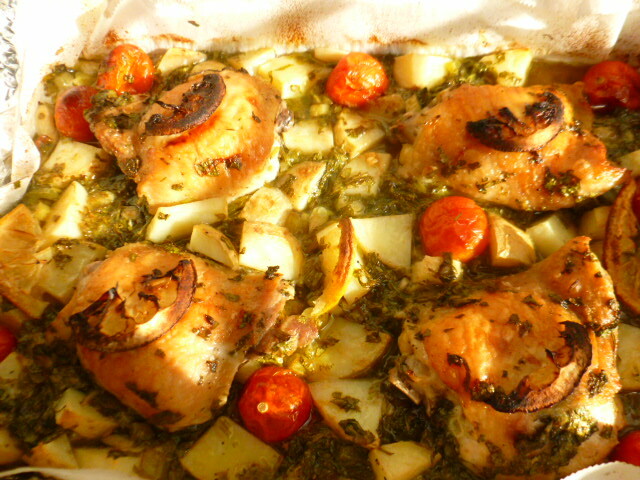 This looks really good ,great combination of chicken with herbs and potatoes! Thighs are my favorite cut, too. This looks so springy and refreshing! Thank you Colleen, I’m glad you liked the recipe. What a lovely recipe Ronit, It seems we were both thinking of fresh herbs now that we’ve moved on to lighter dished. So delicious. I love all the fresh herbs and lemon, a perfect way to tempt spring to finally head our way, huh? Just had breakfast, Ronit, so it’s safe to read through your list of delicious ingredients. Mmmm. Thank you Judi, I’m glad you liked the recipe. This looks so good. Mint leaves? I’ll have to try that. What a nice flavor combo. Ronit, your post makes me hungry! Will have to try this one! I love chicken thighs! This dish looks delicious! Thank you Liz, I’m glad you liked the recipe. There’s nothing quite like chicken thighs to create a beautiful meal like you have. It all looks just lovely put together. My husband totally agrees with you about chicken thighs, they are his favorite part of a chicken. This is a recipe that I will have to make for him…he will love it. 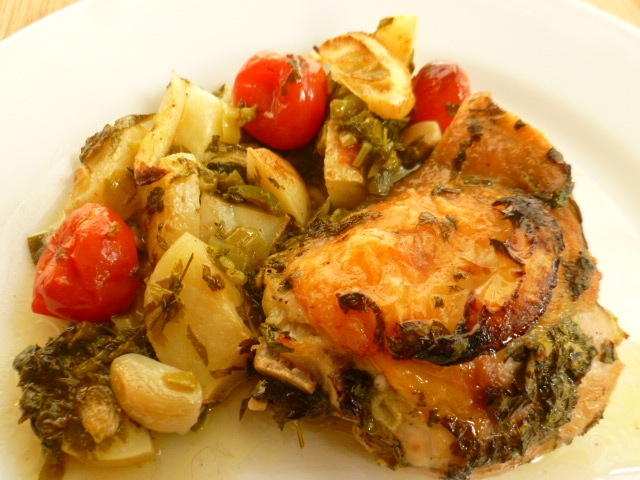 Love the juicy chicken with lots of fresh herbs esp. mint! Chicken thighs are so overlooked! We love them… this looks like a wonderful recipe! Thighs are truly wonderful. Unfortunately my husband has strict rules against them. That’s probably why he has 2% body fat. And there’s no sneaking them! 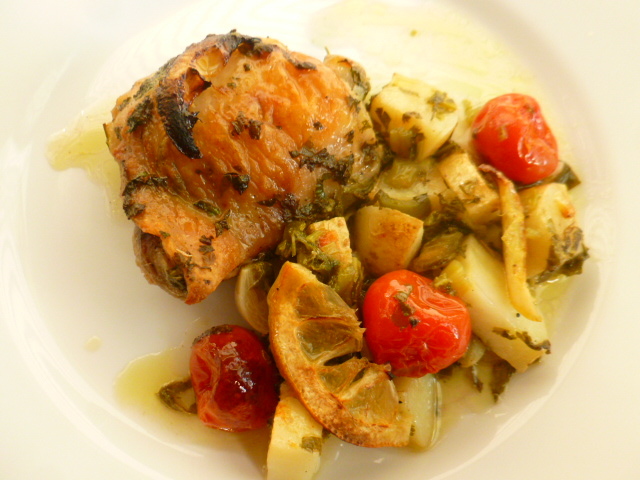 This is a lovely dish – love that herb combination! Thank you Mimi, I’m glad you liked the recipe. The herbs add so much to it. I agree, but if I made chicken thighs I’d have to deal with a tantrum of sorts. So I just make him what he wants. That’s why I have this blog! I love chicken thighs as well but you had me at rosé wine! Those are beautiful flavors and I’m sure it must taste heavenly! Amazing recipe Ronit. Loved the combination of flavours! My favorite part of the chicken! Looks like a great recipe! Chicken thighs are my favorite too Ronit. 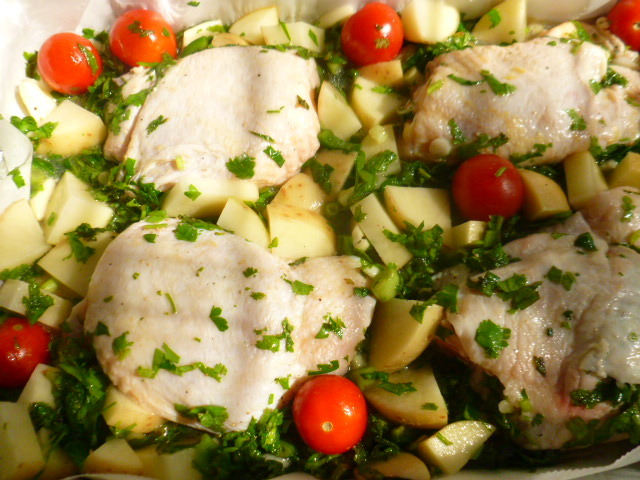 I like the ease of this dish and I can see how flavorful the chicken and potatoes look. i am saving this recipe! Great combo! This is an awesome weeknight meal!